Elko, MN 7/16 Third generation racer Scott Biertzer drove a perfect 25 laps enroute to capturing the Bumper to Bumper IRA Outlaw Sprint Series sanctioned 3rd annual Dirt Nationals at the Elko Speedway. The unique event has a temporary dirt surface layed over the top of one of this countries premier asphalt ovals. Biertzer led the entire distance picking up his third career IRA win in the process aboard the Biertzer-Kohl Maxim. The Friday portion of the scheduled 2-day event fell to rain as nearly 7″ of rain fell at the speedway. The track crew did a splendid job as 26 IRA 410 sprinters competed as though the track had been built years ago, not just a few days prior. Biertzer led front-row mate Russel Borland the first several laps before Greg Bakker moved into the runnerup slot. Mike Reinke and Scotty Neitzel would swap third back and forth as they wrestled the position from Borland. Exciting multi-car battles within the top ten produced three-wide racing, but also a couple of red flags as contact between Brooke Tatnell, Michael Decker, and Scott Uttech eliminated both Decker and Uttech. Then a solid run for John Haeni ended with a fourth turn tumble after he and Travis Whitney touched battling for sixth. Despite the restarts Biertzer was able to keep a few length margin over the field with the final six laps staying green. 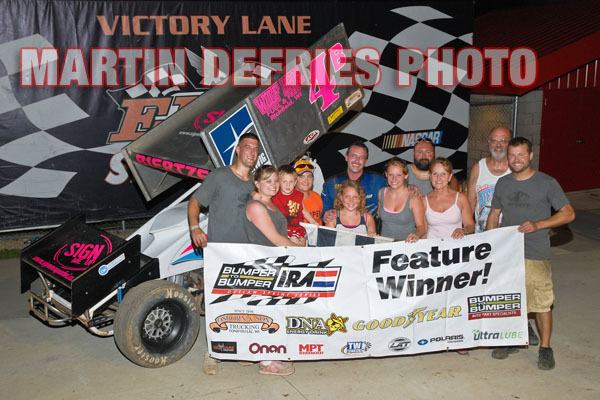 Biertzer took the $2500 win over Bakker, Reinke, Neitzel, and Whitney. Borland, Brian Brown, Bill Balog (from 24th), Phillip Mock, and Tatnell completed a very fast top ten. Whitney out qualified the 26 car field, while heat races went to Borland, Brown, and Biertzer. IRA is supported by Bumper to Bumper Auto Parts & Service Centers, Osborn & Son Trucking, Goodyear, TW Metals, DNA Energy Drink & Snacks, MPT Industies, UltraLube, Big Game Treestands, Cummins Onan, and Polaris DEFENSE.